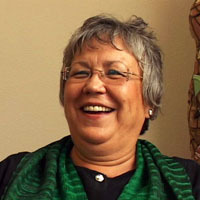 Linda Juneau, M.A., is the tribal liaison and instructor of Native American Studies at the University of Montana. Her interviews provide a window into Blackfeet oral tradition and history as she relates her personal experiences, remembering stories passed down from her elders growing up on the reservation and that she has passed down to her children. Red Paint and Ashes - Linda Juneau. Stories hold us to the Land - Linda Juneau. Napi and the Mice - Linda Juneau.